The article discusses the differences between the electromagnetic pulses at lightning (LEMP) and at high altitude nuclear explosion (NEMP or HEMP). The article also shows that these differences do not allow to transfer LEMP experience on to NEMP. The author questions the effectiveness of grounding of electronic equipment as the main protection principle against NEMP, even though this method of protection is stipulated by all the regulatory documents and standards. An electromagnetic pulse (EMP) occurring when lightning (LEMP) hits grounded facilities (either a tree, tower, building or a lightning rod) is a natural phenomenon that has been known for as long as mankind exists. During the last century, this phenomenon was well studied and this allowed to adopt some methods and techniques, which are widely used as protection from EMP. As for the electromagnetic pulse of high altitude nuclear explosion (NEMP), which occurs near the ground surface upon nuclear weapon detonation at high altitudes (30 – 400 km), the situation is different. The first trials to study NEMP were held in USA in the summer of 1962. 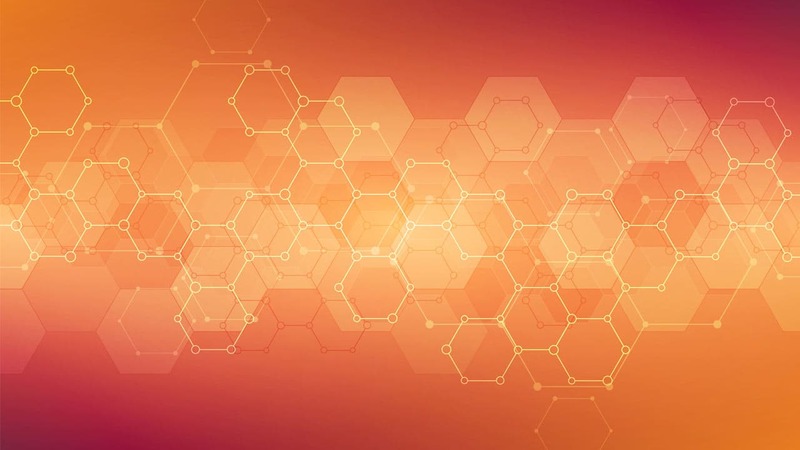 During these trials, powerful electromagnetic pulses were registered, which could vastly affect electronic equipment, communication and power supply lines, radio and radar stations. They even knocked out street lighting in Hawaii, which is located about 1,500 km from the center of the explosion. In the fall of 1962, the Soviet Union also conducted three high altitude nuclear explosions, (each with a capacity of 300 kt) under the project called “Project-K” above the military fire range Sary-Shagan (Karaganda region, Kazakhstan) in order to study NEMP phenomenon. During these trials, an impulse current of up to 3400 A was registered in aerial telephone line cables, which resulted in the emergence of a pulse voltage with an amplitude of up to 28 kV; actuation of all the arresters installed in the equipment and blowing of all the fuses accompanied by shutdown of communication system; damage of radio communication systems located 600 km away from the center of explosion; outage of a radio location unit located 1000 km away; damage of transformers and power generators at power plants; insulator punctures of overhead transmission lines. Serious damage of equipment was also reported at Baikonur Cosmodrome. It should be noted that this refers to equipment manufactured in the 1960s, i.e. the one using electromechanical elements and vacuum tubes, which is much more resistant to EMP than modern digital and microprocessor-based equipment. The destructive impact of both types of EMP on the objects is alike and is stipulated by two factors: very high amplitude of voltage pulse applied to the object and high pulse current flowing through this object, as well as other secondary EMP outcomes related to these two factors, which are dangerous and damaging for electronic and electrical equipment. This similarity of destructive impact resulted in the fact that the lightning protection methods and techniques, which have been properly researched and tested, started to be applied to NEMP. An example would be the fundamental principle of protection against the lightning: compulsory grounding of objects through the minimum possible resistance and the use of gas discharge tubes and filters that divert the pulse’s energy to the ground. Is it really true? 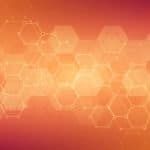 Are the specifications of LEMP and NEMP so similar to allow identical methods and techniques of protection? In fact, LEMP is a local electric breakdown of gas space (air) between two electrodes featuring high potential difference between them: a cloud and the earth (or an object located on the earth and featuring the earth’s potential), Fig. 1. However, NEMP is a distributed electric field, which covers a large area and affects the objects located hundreds and thousands of kilometers away from the explosion epicenter due to spatial relocation of charged particles, e.g. electrons and ions that appeared as a result of complex physical processes, which occur upon the nuclear explosion in the atmosphere, Fig. 1. Moreover, the structure of this field is not uniform and can be conditionally split into three component parts: Е1, Е2 and Е3. E1 is a very short pulse of electric field shaped as 2/25 ns with the field gradient of 50 kV/m near the ground surface. E2 is a weaker electric field’s pulse with duration from several to dozens milliseconds. E3 is a very long low voltage pulse of electric field, which has to do with various processes in ionospheric medium. This can last up to several minutes and stipulates occurrence of significant quasi-DC currents in long-distance conductive media, such as rails, pipes, cables and wires. E1 is the most powerful, destructive and complex pulse (from the standpoint of protection) with vertical and horizontal polarized parts. Thus, when saying NEMP in this article, it will mean E1 as its main component. 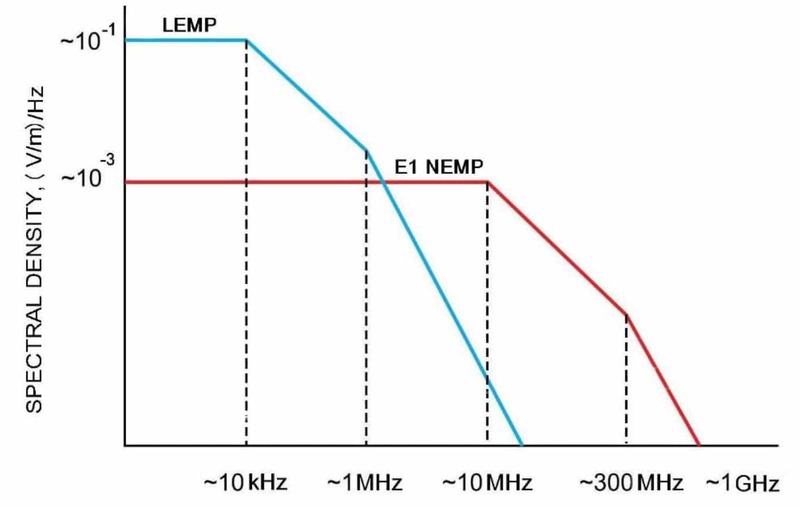 Compared to LEMP, NEMP is less powerful (Fig. 2) and significantly shorter (Fig. 3), but as it covers a large area and affects thousands of facilities simultaneously; it is more dangerous than LEMP. As stated above, both LEMP and NEMP can relocate over a distance and reach the ground surface in different ways. In case of LEMP’s relocation through the ionized channel represented by a single or even branched cord, the situation is more or less clear. However, in case of NEMP the situation is much more complicated. First, the shape of NEMP’s electric field near the ground surface is developed subject to the Earth’s magnetic field; it is rather uneven. Second, the electromagnetic wave reaches the ground surface at a specific angle and thus, the electric field near the ground surface possesses both vertical and horizontal components. Third, part of electromagnetic energy, falling onto the ground surface at an angle, will be reflected and can consolidate with the energy falling onto the ground. These differences between LEMP and NEMP make it possible to assume that they are different in their effect on the objects located on the ground surface. Indeed, if we take a 10-meter metal rod, push one of its ends into the soil (vertically) and attach to it a current sensor, when lightning hits the open end of the rod, the sensor will register high amplitude current flowing through the rod as its grounded end has got zero (conditionally) potential, while the upper end takes up high (relative to ground) potential of the lightning. When we have the bottom end of the rod well insulated from the ground surface and install it vertically, then there will be no current in the rod, even if we assume that lightning hits it, as there is no potential difference between the rod’s ends (different capacitance values of the rod’s ends relative the ground can be neglected due to their low level). If NEMP impacts the same insulated rod, there will be high potential difference between its ends (theoretically, dozens of kilovolts) and the current sensor will register the relatively high amplitude current pulse flowing through it. Moreover, high potential difference occurs between the rod’s ends, even if it is located horizontally relative to the ground surface. What happens if we ground one of the ends of this horizontal rod? It is a much more complex case because NEMP penetrates in the soil and induces gradients directly in the soil. This effect takes into consideration the model of a power transmission line with grounded neutral to study the NEMP affect. In such a model, the voltage on the open second end of the line to the ground will depend on the transmission line height above ground, its length and soil conductivity . But this model is not our case with insulated ends of the rod, and in our case the grounding of one of its ends does not affect the voltage gradient between the ends. The same effect will occur at a single electronic device installed in a cabinet in a control room with fully electrical insulated (without considering capacity to ground) control cables connected to its inputs. The electric field affecting these cables has nothing to do with the ground and its potential. In other words, such cables with potential difference induced on its ends by NEMP acts as a EMP source insulated from the ground for electronic devices. It works as a charged accumulator battery in an insulated body. What happens when only one pole of the accumulator battery is grounded? Just nothing! Neither with the accumulator battery, nor with the insulated load, that receives power from this accumulator. So, why would something happen if we ground the NEMP affected small local object as a control cabinet with electronic devices inside? This question is very important and highly relevant as it directly affects efficiency of equipment intended to ensure protection against NEMP. According to : “The early-time E1 HEMP waveform also couples efficiently to short lines (1-10 meter) connected to equipment (power, signal lines, etc.) and can induce large voltages and currents that can be conducted to the inside of the equipment”. In this sentence there is no relation to ground. 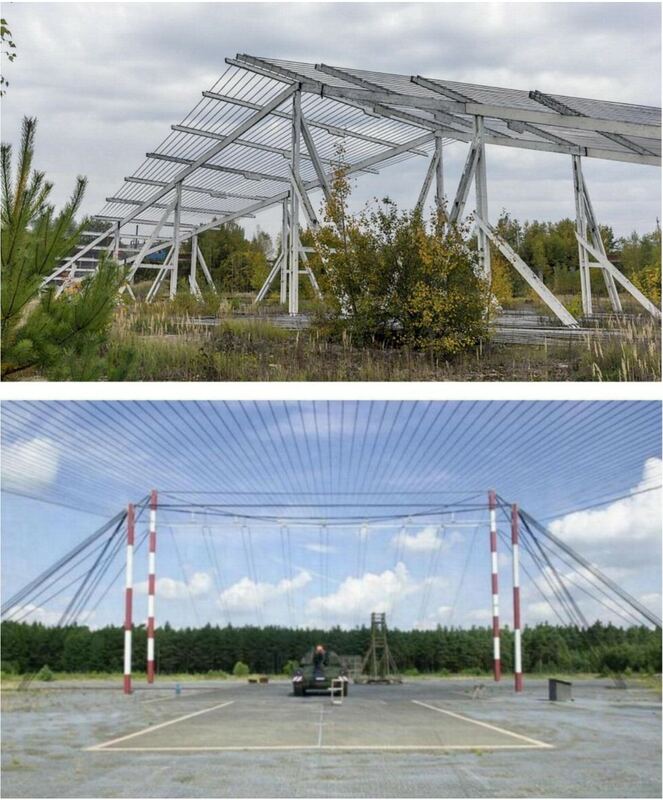 Unfortunately, it is a very difficult to study this phenomenon in an open area test site simulator (OATS) suitable for simultaneous testing the group of electrical control cabinets with cable connection between them, because most such simulators contain a Marx generator and two electrodes: one grounded mesh and another one – an insulated mesh placed above the grounded mesh at a height 5 – 20 m, Fig. 4 (so-called “single port open waveguide simulators”). A simulated electrical pulse field is applied directly between these two electrodes, between the upper electrode and the ground. In such a simulator, well grounding the equipment under test (that is a low impedance connection the shields and metal shells of equipment to the down electrode) will always play the role of effective protection means as at lightning testing. The grounding of the down electrode is due to necessity simulating the influence of ground reflection on the field in the test volume. However, in contrast, in small radiated test facilities equipment under test (EUT) shall be placed on the dielectric stand above the ground plane within the test volume, according to IEC 61000-4-20 standard . In our opinion, to study the aforementioned phenomenon in a large OATS also can use dielectric plate between EUT and down electrode without EUT grounding. Various standards, (both civil and military) as well as different guidelines and recommendations, justify the necessity of compulsory grounding of all types of electronic and electrical equipment as the main protection means against NEMP. But why, if the grounding system does not act as an opposite electrode with an opposite charge for NEMP (unlike a lightning strike)? According to  “In general, the reason for grounding are varied, and it would be presumptuous to attempt to specify grounding procedures without first establishing the reasons for grounding and the goals that the grounding system should achieve. These reasons and goals are usually based on system functional, safety and RF interference considerations as a consideration in the ground-system design, at least one more goal has been added (EMP hardness), but the reason for grounding may remain unchanged. The basic reason for providing a “ground” in electronic equipment is to establish a firm reference potential against which signal and supply voltage are measured (or established)”. – “A “ground” is commonly thought of as a part of a circuit that has relatively low impedance to the local earth surface. A particular ground arrangement that satisfies this definition may, however, not be optimum and may be worse than no ground for EMP protection” . – “For HEMP protection, however, the grounding system is considered a potential path for transient penetration into the system and a means of distributing transients throughout the interior . “The primary effect of the HEMP is, therefore, the production of large voltages or currents in large structures and conductors such power lines, buried cables, and antennas, as well as in facility grounding systems” (page 935)…. And in the same page: “The goal of all grounding and bounding techniques is to redirect the HEMP-induced currents to the earth” . “The grounding required for EMP protection… (page 5-5)”. In fact, many individual printed circuit boards of this equipment have got their own “ground”, i.e. 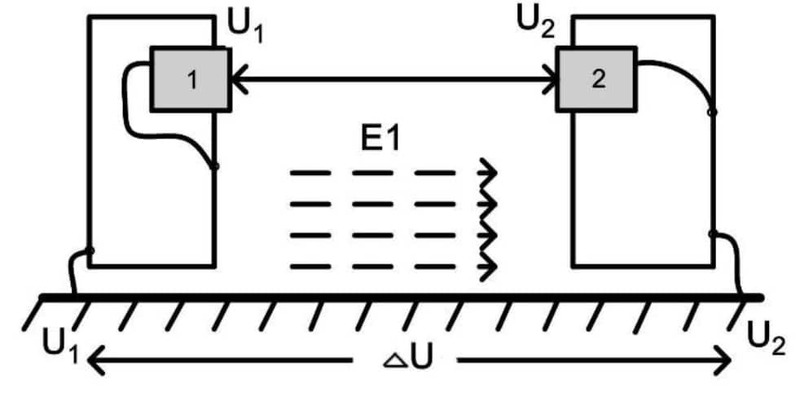 a system of conductor strips with a so called “zero” or “reference” potential; all the other potentials necessary for equipment operation will emerge relative to the former. As a rule, this internal ground is connected to a metal body, which, in turn, is connected to an external grounding system. The potential of the grounding system is known to increase under the common lightning strike. 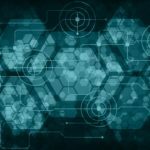 At the same time, it is considered that if all the electronic devices will share the potential of a grounding system, i.e. there will be no difference of potentials between the circuits of “zero potential” of various devices, this increase of common potential and its difference from zero, that takes place in all the devices simultaneously, cannot cause malfunctioning of these devices. The whole theory of grounding is based on this assumption prescribing to maintain minimum resistance of grounding system’s elements, using equipotential planes, etc., in other words, the measures aimed at prevention of a difference of potentials between “zero potential” circuits, distanced from each other and hence grounded at different locations, but at the same time they stay in electric and informational contact. Furthermore, the issue of what happens in a single electronic device during the rise of its “zero potential” circuit is not addressed. 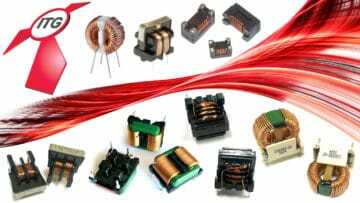 The fact is that any electronic circuit contains a lot of non-linear elements and those that possess capacitance and inductance and connected to “zero potential” circuit. As a consequence, voltage and current will not rise simultaneously at different points of the circuit during the potential rise in it. You can visualize it as a plate supporting weights of different mass that are attached to this plate by means of springs of various rigidity. If we start raising this plate gradually (i.e. during the gradual increase of potential energy), the potential energy of all the elements resting on this plate will increase simultaneously. However, if we raise the plate abruptly, the elements will not change their position and potential energy simultaneously. Additionally, if they were mechanically united, perhaps this would even result in breakages of those connections. Thus, the availability of the equipotential plane and maintaining zero difference between the circuits of “zero potential” of different devices does not guarantee the absence of malfunctioning of highly sensitive electronic equipment. Fig. 5. The impact of high voltage on the inputs of electronic equipment remotely located from each other in grounded bodies upon the impact of E1 component of NEMP onto the grounding system. Usually, devices designed for protecting equipment from NEMP overvoltage, are connected between the circuits to be protected and the grounding system (common mode protection), Fig. 6. Fig. 6. Simplified design of various LC-filters against NEMP and devices protecting from pulse overvoltage with parallel elements that divert impulse energy from the input to the ground. VR – varistors, GDT – gas discharge tube. 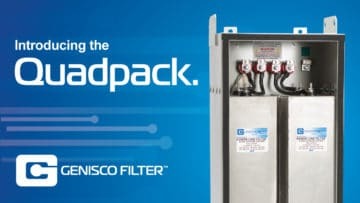 Special filters intended for NEMP protection include non-linear elements that divert impulse energy from the filter inputs to the ground, Fig. 7. Fig. 7. 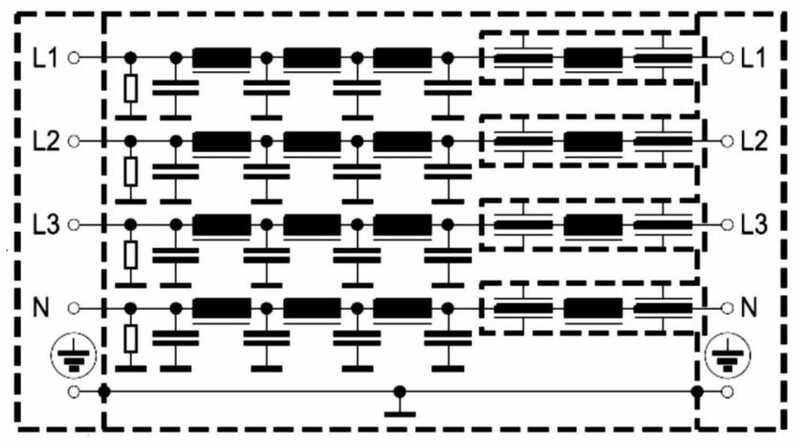 Real design of 3-phase NEMP filter that contains non-linear resistors connected between each input of the filter and the ground (in addition to capacitors that divert energy to the ground). Another problem is the difference in parameters of such filters for a pulse applied between the input and the ground compared to the pulse, applied between individual inputs, Fig. 7. At the same time, main protection is designed between each input and the ground. Many filters have been designed with only one input terminal, one output terminal and the grounded body (Fig. 8). Thus, they are intended to protect sensitive inputs of equipment solely from pulses featuring higher amplitude relative to the ground and divert energy from the input to the ground. Fig. 8. Filters protecting from NEMP pulse applied to equipment input terminals relative to the ground. However, when the grounding system does not represent the area of reverse potential or zero potential for NEMP, where will the pulse energy be diverted? 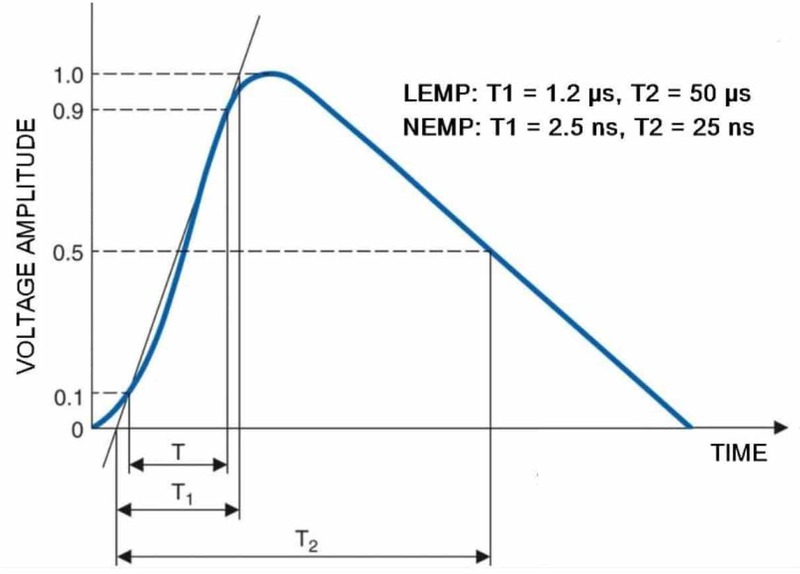 And when a similar pulse occurs on the grounding electrode simultaneously with high voltage pulse occurring on the input of a filter or a device protecting from overvoltage, how will this filter weaken NEMP? These questions are still waiting to be answered. Thus, the specialists invite active discussions concerning this problem because “grounding may not be a solution; rather it could be part of the problem”. 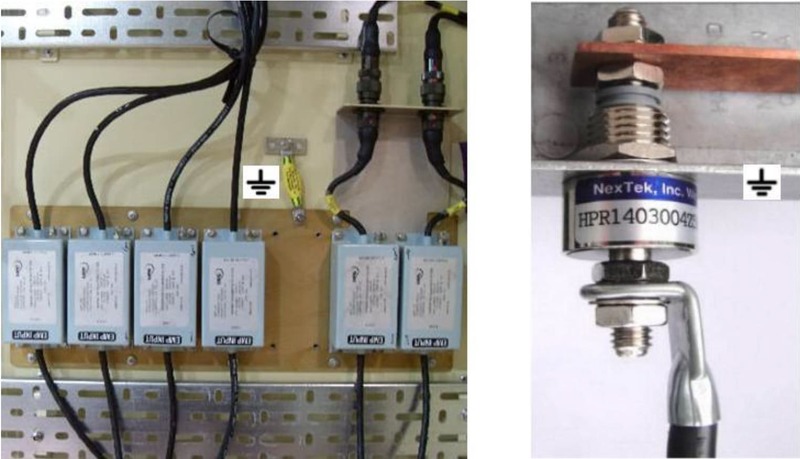 Use of grounding of electronic and electric equipment as the main NEMP protection is not only questionable but also may be dangerous, as instead of NEMP weakening, it can enhance its destructive impact on equipment. However, since this grounding is stipulated in all the regulatory documents, this problem needs to be further discussed with the relevant specialists. Scharfman W. E., Vance E. F. Electromagnetic Pulse Coupling and Propagation to Power Lines: Theory and Experiments. – Final report AFWL-TR-73-287, Stanford Research Institute, 1974. High-Impact, Low-Frequency Event Risk to the North American Bulk Power System. A Jointly-Commissioned Report of North American Electric Reliability Corp., and U. S. Department of Energy, November 2009 Workshop. – NERC, 2010. Vance E. F. Electromagnetic-pulse Handbook for Electric Power Systems. – Report AD-A009 228, Stanford Research Institute, for Defense Nuclear Agency, 1975, 341 p.
 Gurevich V. Functional Grounding of Digital Protective Relays. – Transmission & Distribution, Australian Power Technologies, 2015, issue 6, pp. 32 – 35. Gurevich V. Accessible Methods Resilience of Power System Electronics to HEMP. – International Journal of Research Studies in Electrical and Electronics Engineering (IJRSEEE), 2016, vol. 2, issue 2, pp. 13 – 18. Gurevich V. The Issues of Electronic Equipment Grounding at the Power Facilities. – International Journal of Research Studies in Electrical and Electronics Engineering (IJRSEEE), 2017, vol. 3, issue 1, pp. 11 – 19. 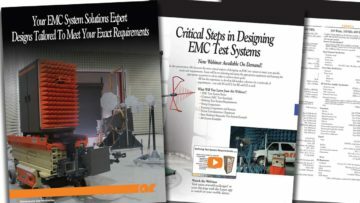 IEC 61000-4-20 Electromagnetic compatibility (EMC) – Part 4-20: Testing and measurement techniques – Emission and immunity testing in transverse electromagnetic (TEM) waveguides. TM 5-690 Grounding and Bounding in Command, Control, Communications, Computer, Intelligence, Surveillance and Reconnaissance (C4ISR) Facilities. Headquarters Department of the Army, Washington, DC, 2002. The Effects of Nuclear Weapons. – U. S. Department of Defense and Energy Research & Development Administration, 1977, 660 p.
 Vance E. F. The Nuclear Electromagnetic Pulse. – Handbook of Electromagnetic Compatibility, Edited by Renaldo Perez, Academic Press, 2013.